Yeah, we’ll maybe it’s more like your lunar eclipse dose of snark. I can’t be bothered with daily. Anyhoo, I have been thinking this week about 2 important things: the floral print mafia, the global plot to reduce America to mediocrity, and their unlikely (but clearly asserted in this diatribe) connection. First, the insidious threat that is gripping Southlake, Texas–the Vera Bradley lobby. Everywhere I go I’m assaulted by the quilted, technicolor menace. 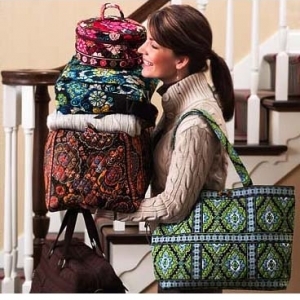 The latest uproar seems to be that teachers aren’t allowing VB totes in the classroom, claiming it is becoming too crowded and all that color is a strain on the eyes. That’s discrimination! Clearly, it is within my 11 year old’s rights to carry twice her own body weight in a yurt-sized cavity of cheerful daisies and snails! School board, what is your %$*@ing problem with daisies and snails? Don’t you have more important things to do, like solve the problem in the next segment? Haters. Which brings me to my next point–the global subterfuge that is dumbing down America. We manage that fine on our own, thank you very much. I never realized how ridiculous the English language is until I tried to teach someone to read. Mind you, the child can read in Spanish just fine. Yes, I know it’s quaint that rough, bough, and cough don’t rhyme, or sound remotely alike, or make any sense whatsoever. And don’t get me started on the word “rhyme.” But think of all of the time wasted on spelling tests and spelling words. There is no such thing as a spelling test in a phonetic language because it is spelled the way it sounds. Always. (That’s actually the definition of phonetic). An hour a day on spelling, spelling tests, spell check, and spelling correction, over a lifetime of 85 years is over 31,000 hours wasted while Germans and Spaniards play their violins. Imajin if we al wrot foneticlee and al the ours we wood sav–so manee more resipees on Pinterest! Think about it. We could eliminate entire uses for letters. There is no point in a soft c, when you have a perfectly good s. There is no hard g because that’s what we have j for. And y is just a stupid letter. It’s the appendix of the alphabet. It offends my sense of efficiency to have all of this extraneous stuff. And why do we have the word extraneous at all, if extra suits just fine? And yet, these foreigners keep pushing it on us. They continue to learn English so we won’t catch on. Don’t you see it? They have us cornered, spending all of our time learning how to spell with not even our Doodle Daisy Convertible Crossbody for consolation. Bastards. This entry was posted in Ramblings and tagged daisies and snails, phonetic language, pinterest, quilted goodness, spelling, vera bradley by blmilhizer. Bookmark the permalink. You crack me up! Every time! Just remember, absurdities make good comedy. So good. Those VB patterns just hurt my eyes. The spelling of “phonetic” seems like a great place to start.